The EIA estimates that the MENA region collectively holds 800 billion barrels of proven oil reserves and 2,800 tcf of natural gas. In recent years, focus in the region has been on addressing key challenges such as the environmental impact of the production, refining and domestic consumption of resources, as well as the economic impact of subsidies. As MENA countries strive to address these challenges, the region is also expected to be one of the largest contributors to the global increase in energy demand, placing additional pressure on consumption patterns and placing the spotlight on the power-generating sector’s efficiency. 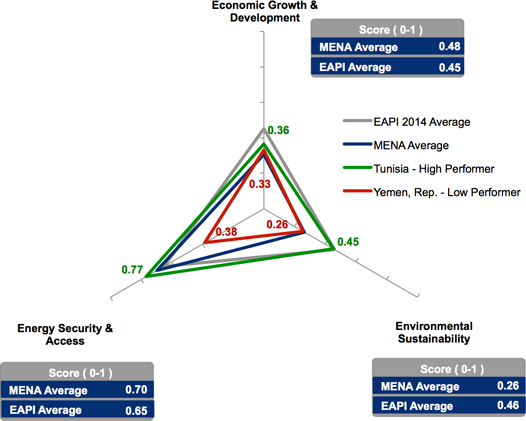 The top performer in the MENA region is Tunisia with a score of 0.53/1 compared to the regional average of 0.42/1. Tunisia’s performance relative to other countries in the region is driven by the country achieving the highest regional performance in environmental sustainability and upper quartile scores for the other two dimensions of the energy triangle. The low performers in the MENA region are also the lowest performers globally: Lebanon and Yemen occupy, respectively, the 123rd and 124th ranking across the index. Yemen’s low ranking performance arises from a combination of fuel subsidies, reliance on fossil fuels for primary energy supply, and low electrification rates. The disparity in scores across the region is driven by a number of factors. Most notable perhaps is the regional co-existence of some of the largest net exporters in the world, such as Qatar and Kuwait, alongside the high import-dependence of countries like Morocco, Jordan and Lebanon, who rely on imports to meet over 90% of their energy demand. Despite the high performance of net-exporting countries in the energy security dimension, their performance in the other dimensions of the energy triangle is low. Results are impacted by the prevalence of high fuel subsidies in the region that create inefficient use of resources along with high cost, and the dominance of fossil fuels in the energy mix that result in high CO2 emissions and reduce the use of low-carbon energy sources. The average performance of MENA countries in economic growth and development of 0.31/1 places the region below the lower quartile threshold for this dimension globally – Iraq, the top performer in the region, achieves a score of 0.37/1, placing it just over the lower quartile performance of 0.33/1. Although MENA countries receive some of the highest scores globally in export contribution to GDP, the score is negatively impacted by fossil fuel subsidies in exporting nations and the energy intensity of the hydrocarbon production and refining industries prevalent in these. MENA countries dominate the top 10 ranking globally for economic contribution of fuel exports to GDP. For major net exporters such as Qatar, Libya, Bahrain, Saudi Arabia and Kuwait, the contribution of fuel exceeded 50% of GDP in 2012. Conversely, the economic impact of the energy system on net importers like Morocco, Lebanon, Jordan and Tunisia is severe. The lowest performer, Jordan, for example, spends nearly 20% of GDP to import 96% of its energy needs. As explored in the environmental sustainability section below, net importers such as Morocco and Tunisia are rolling out renewable energy capacity in a bid to reduce the economic impact of imports and mitigate against fluctuating fossil fuel pricing. Energy intensity scores for the MENA region vary significantly, with Tunisia, Morocco and Lebanon receiving an average score of 0.64/1 against the regional average of 0.13/1 of the lowest four performers – Iran, Bahrain, Oman and Iraq – who extract US$ 3-US$ 4 of GDP per kgoe. The low performers’ score is a result of the energy intensity of economies centred on the production, refining and petrochemical industries. In addition, a number of MENA countries rely on desalination plants to generate most of their freshwater – this process is energy intensive, consuming up to an estimated 3.6 kWh/litre of freshwater produced.59 Energy efficiency measures in industry and the deployment of advanced technologies such as reverse osmosis in desalination plants – which use the hydraulic pressure created in the process as a power source – are starting to be rolled out in the region. MENA countries achieve their lowest average performance across the three dimensions of the energy triangle in the environmental sustainability dimension, with an average score of 0.26/1 against the global average of 0.46/1. MENA’s top performer is Tunisia, one of the few net-importing countries in the region. Conversely, large exporting MENA countries occupy the seven lowest rankings globally for this dimension of the energy triangle. This illustrates the significant challenge faced by the region in balancing the development and availability of hydrocarbons with an environmentally sustainable energy system. Tunisia’s performance in the environmental sustainability dimension is largely due to the 15% contribution of renewables to the country’s total primary energy supply, compared to the average 1% in net exporters of the region. In 2012, Tunisia’s total installed capacity from renewables was 220 MW, with 154 GW delivered by wind, and 4 GW from solar PVs. Along with other MENA countries, Tunisia has set targets to grow the share of renewables to 2030. Tunisia aims to increase renewables to 25% electricity generation and 40% installed capacity over this time period.60 A number of policy initiatives have been enacted to support this goal. These include net metering pilots and financial and fiscal incentives, as well as public investment and the provision of loans to renewable projects. Furthermore, Tunisia, together with Morocco, is piloting solar water heating systems through schemes such as the PROSOL in Tunisia and the PROMASOL in Morocco. For net importers in the region, expanding domestic energy supply and reduce import dependence through the deployment of renewable energy is increasingly important. Net-exporting MENA countries feature among the lowest performers on the environmental sustainability dimension of the energy triangle, occupying the lowest eight ranks globally. Fossil fuels dominate the total primary energy supply, with net exporters in the region receiving an average 1% contribution from alternative and nuclear energy. The dominance of fossil fuels also impacts CO2 emissions from the power-generating sector – over 50% of MENA countries score in the lower quartile for this indicator, with the highest CO2/kWh emitters being Saudi Arabia, Iraq, Oman, Libya and Kuwait, also being some of the largest net exporters in the region. The abundance of natural resources and the persistence of fuel subsidies mean the diversification of energy sources remains a key challenge for the region. Nevertheless, an increasing number of petroleum-exporting countries are setting out plans to deploy renewables in their energy mix. According to a recent report61 from the Renewable Energy Policy Network for the 21st Century (REN21), a leading research centre on renewables, as of May 2013, all MENA countries have renewable energy targets, up from just five countries in 2007. These include renewable capacity additions of 6 GW in Oman, and 55 GW in Saudi Arabia by 2020. 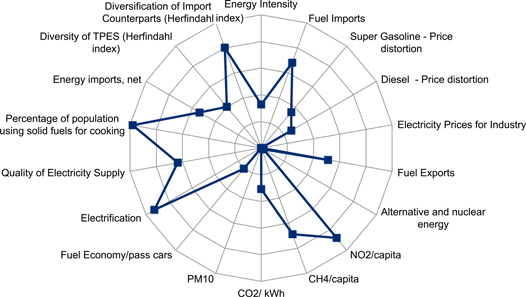 The greenhouse gas emissions associated with upstream and refining industries play a role in performance across emission-related indicators. While Qatar is the third largest natural gas producer and largest LNG exporter in the world, it is also the largest per capita emitter of methane from energy globally at 0.02 metric tons of methane (CO2-eq) – almost double the share of the next worse performer, Brunei Darussalam, at 0.01. However, according to the World Bank, over the period 2000-2008, flaring of methane was reduced in Qatar from 9 m3 per boe to 11 m3 boe, while production of gas increased nearly four-fold.62 The Qatari government is investing in flaring reduction measures as a key part of addressing environmental impact and the efficiency of its hydrocarbon industry. The Qatar National Development Strategy 2011-2016 sets the key objective of halving flaring between 2008 and 2016. Part of the strategy includes developing a flaring monitoring tool as one of the 10 environmental strategy priorities for 2016. The MENA region achieves its best performance in the energy security and access dimension of the energy triangle, with an average dimension score of 0.70/1 and Saudi Arabia scoring 0.81/1. The region’s resource richness means that more than half of the global top 20 performers in the energy imports indicator are MENA countries. However, a number of MENA countries lack sufficient domestic resources and depend heavily on imports from neighbouring countries for their energy supply. The MENA region holds over 50% of the world’s proven oil reserves and 40% of natural gas reserves.64 Nevertheless, the scores of MENA countries are widely dispersed within the energy security dimension of the triangle. Qatar and Libya export over 200% of net energy consumption; on the other hand, Morocco, Jordan and Lebanon are almost entirely reliant on energy imports, at over 95% net imports. For import-dependent countries in the region, progress in diversifying the energy mix is a key long-term objective, as rising oil prices and increasing energy demand impact their energy security landscape. Overall electrification rates in the region are high, with an average 0.96/1 score for the corresponding indicator. Yet, according to the IEA, 9% of the population in the Middle East lacks access to modern energy. In Yemen, the lowest performer for the indicator, only 45% of the population has access to modern energy. Similarly, 33% of the country’s population relies on solid fuels for cooking, a figure significantly higher than the 5% regional average. The World Bank has committed funds to improve energy access in rural areas of Yemen, with the largest portion of the projected spending focused on developing on-grid connections and exploring the potential of off-grid solar solutions. 57 Please see the methodology section of the Appendix for details on thresholds and scoring for super gasoline and diesel price distortion. 58 Redrawing the Energy-Climate Map, June 2013. Paris, France: IEA. 59 Seawater Desalination Power Consumption, November 2011. Virginia, USA: WateReuse Association, Desalination Committee. 60 MENA Renewables Status Report, June 2013. REN21. 62 Global Gas Flaring Reduction partnership (GGFR). 63 EOR refers to a range of techniques to increase the amount of crude recovered in drilling operations and extend the lifetime of diminishing assets. Among EOR techniques, carbon dioxide flooding involves pumping large quantities of CO2 into reservoirs to reduce the viscosity of hydrocarbons and facilitate their recovery. 64 “Energy in MENA”. World Bank, http://go.worldbank.org/88TPPX6OF0, 2010.